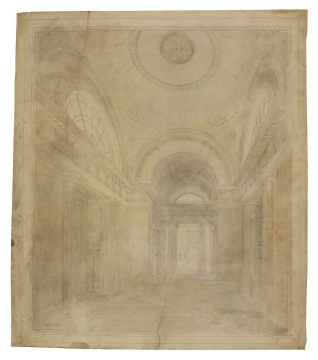 Drawing 44 was re-used as an illustration for Soane's Lecture VI at the Royal Academy, in which he condemns his own design as an example of the improper composition of arches with Greek orders. In the lecture, Soane criticizes his own design but cautiously hems it in praise: 'I shall instance a building which has received no small portion of approbation, and had I not been led by the composition of these lectures to search into original causes and first principles, the defects in this design would not have been noticed' (Watkin, p.568). Drawing 44 was possibly exhibted at the Royal Academy in 1808 under the title 'View of a vestibule in the Bank of England' (778). 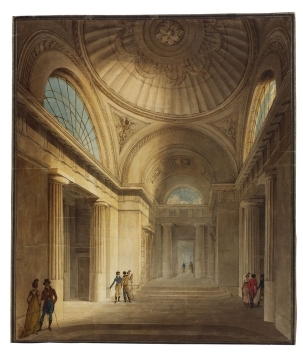 The perspective is by Gandy and the staffage was added by the painter Antonio van Assen (exhibited at the Royal Academy between 1778 and 1804). D. Watkin, Sir John Soane: englightenment thought and the Royal Academy lectures, 1996.